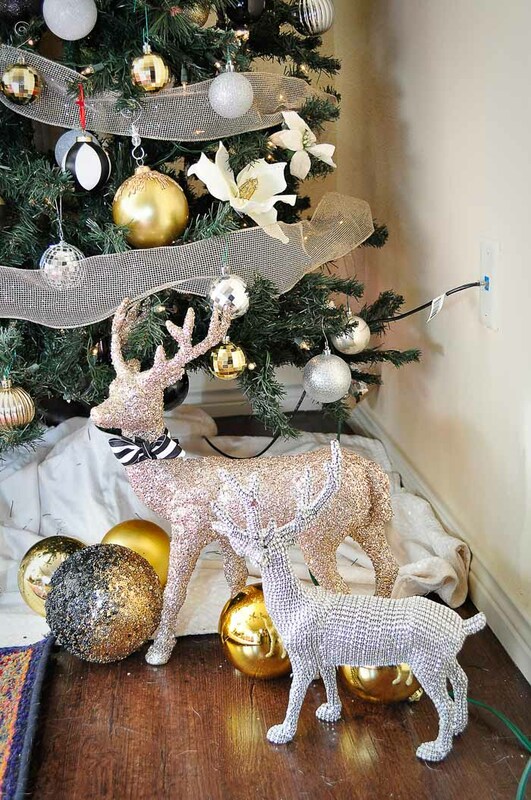 I’m back and it’s time to showcase my 2016 Winter Eclectic Holiday Home Tour! Apartment living has really forced me to embrace my eclectic side since the spaces are small, and I only brought certain pieces of furniture over from the house. So whether they work together or not, they’re going to be together. I showed you all a bit of my living room when I first moved in, and since then I’ve made quite a few changes! 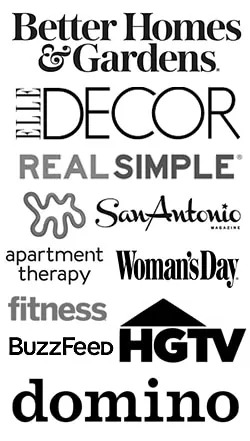 Before I dig in though, I’d like to give a shoutout to the hostess of this fab blog hop, Jess from Domicile 37. And if you’ve landed here thanks to my friend Rachael’s blog, This Is Our Bliss, welcome! Pull up a chair, grab some cocoa and enjoy. Ok, so back to the layout. Ultimately I chose this apartment because it had separate living and dining areas…and I use the word “areas” loosely because both spaces are still small compared to my house. The position of the TV was driving me nuts because I couldn’t see it when I was in the kitchen, so I moved it to the wall adjacent to it, and GASP…I covered up a window, which to some is a cardinal sin. I’m sorry. I figure my wall of curtains creates a wall of sorts, so I’m cool. So, here’s what it looks like now. I pulled the tiny little loveseat bench over from the dining nook so I wouldn’t have a glaring bald spot under my oh so gorgeous horse print from Minted. It fits two people or one Pee Wee (he’s stingy with space). 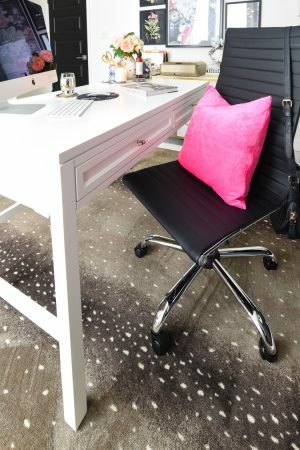 Overall, it’s a cozy space that seats 1-5 people, plus the coffee table/bench can accommodate another one or two in a pinch. Multi-functional furniture (with storage!) is a must in small apartment living. 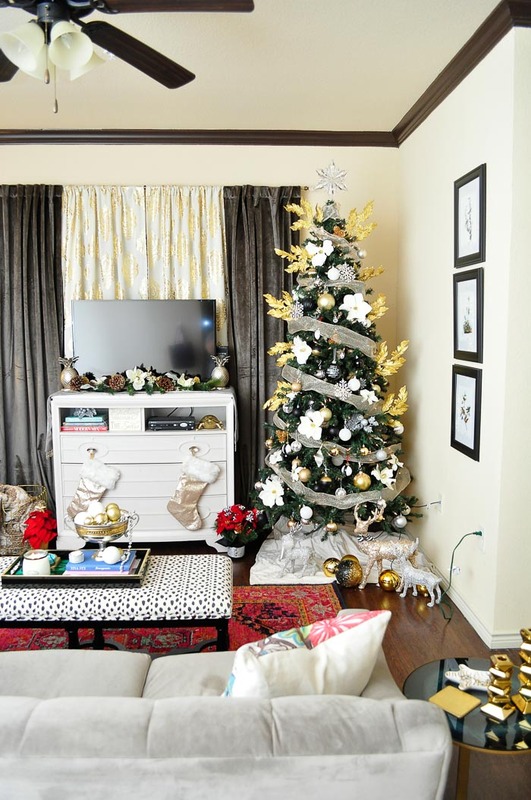 You all saw my tree on Wednesday (if you didn’t, click here for a more in-depth look at the glam! ), and it fits perfectly in this corner. It’s so lovely coming home after a long day and watching TV with only the light from the Christmas tree and a holiday scented candle. It’s cozy, dreamy and indulgent. I don’t have a mantel or fireplace anymore (sniff, sniff), but I created a makeshift one using my TV stand. 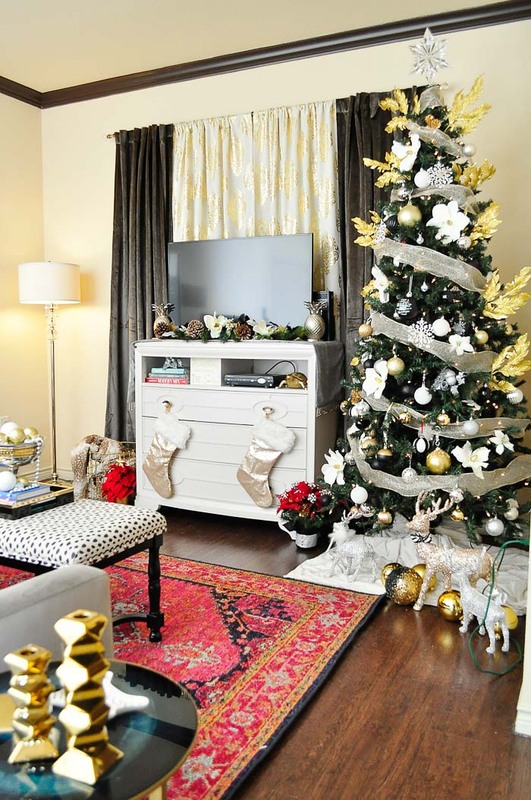 Some gold sequin stockings hang from the drawer pulls and a small three-foot garland adorns the top. Some pineapple bookends keep it all in place. 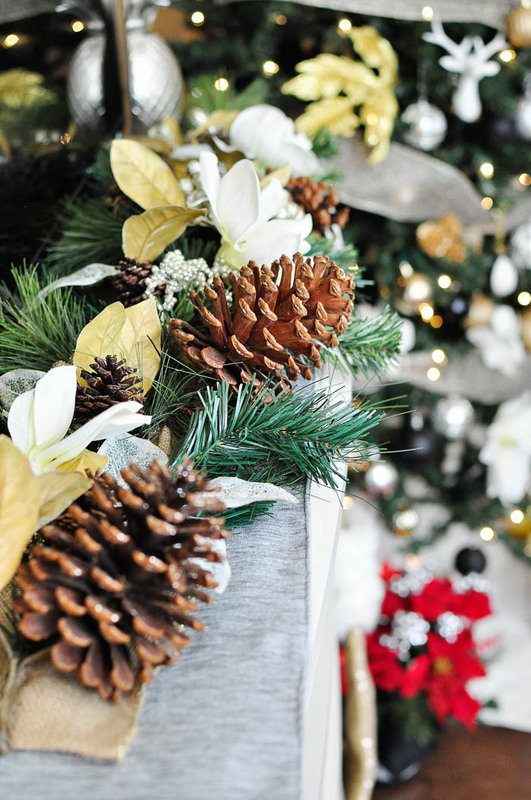 I love the way the garland features large pinecones and white flowers that play off the Christmas tree décor. On the coffee table, my thrift store score from my Marble Falls vacation holds an assortment of ornaments, some books, coasters and a small jewelry dish made by my friend Maura. 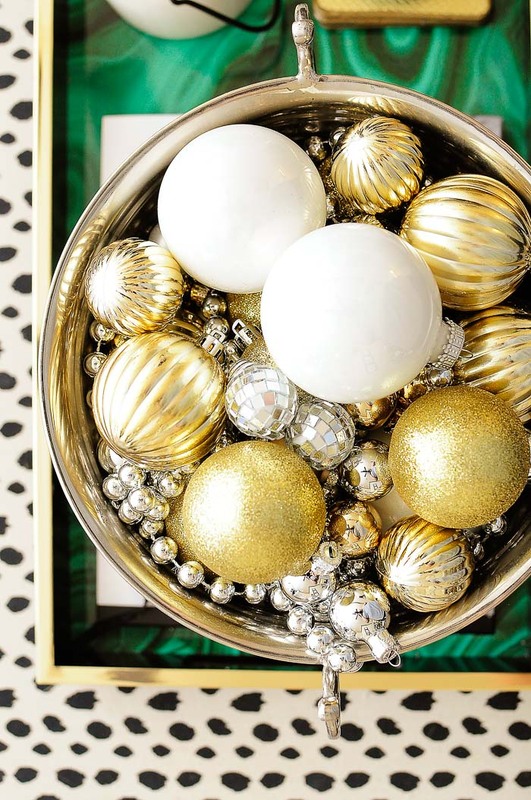 This malachite tray gives me life! One of my best purchases from 2016 and I’m not even a huge fan of the color green usually. 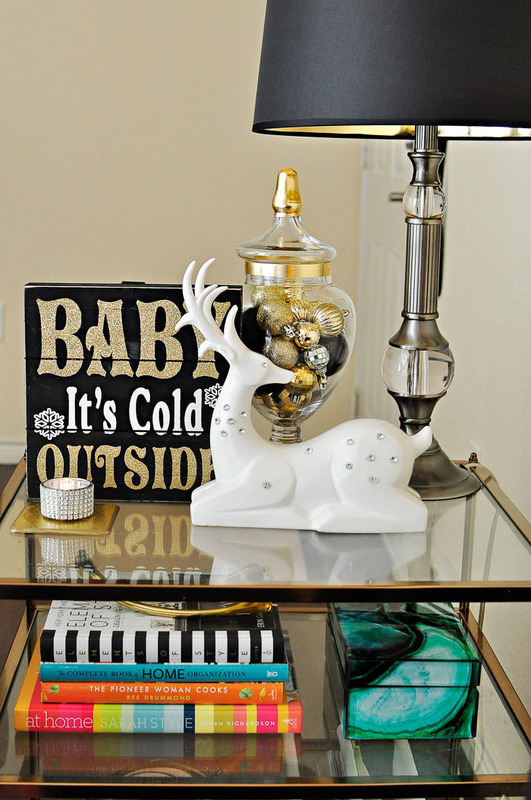 On the end table, I placed more ornaments in an apothecary jar (seriously, if you have extra ornaments just dump them in vessels for instant décor) and paired it with a deer and art print. Another recent purchase is that malachite box— cohesive accessories are my jam. A gold tray anchors all the pieces together, plus it makes it easy to quickly move it if we need room for food/drink. This apartment is finally starting to feel like my very own eclectic apartment, and I couldn’t be happier. 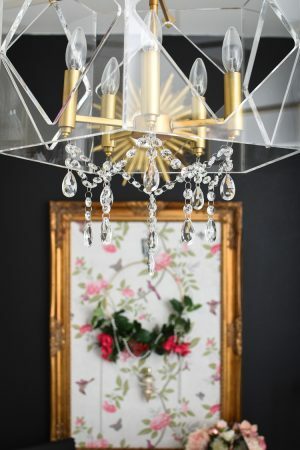 Seriously, it’s so much fun focusing on décor and storage as opposed to painting walls and using power tools, which I do love, but it’s also nice to just pick fun accessories and look at temporary wallpaper options. I also for the first time ever decided to bring the holidays into the bedroom via some simple décor on the headboard. 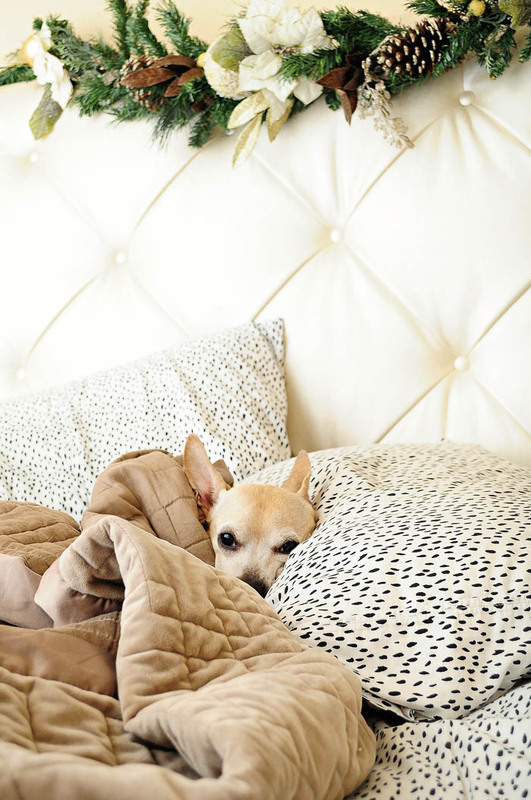 Pee Wee loves the cozy bed during these colder winter days. As you can tell, he’s spoiled and we wouldn’t have it any other way. 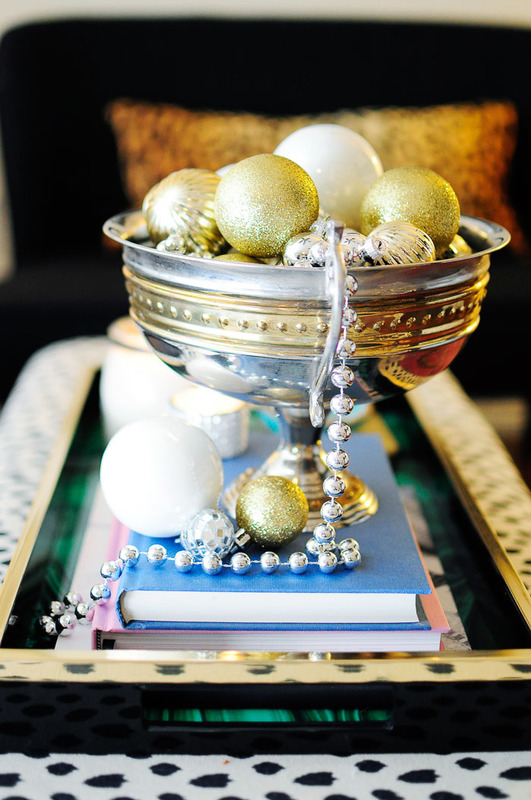 Thanks for coming over to my place, and I hope you enjoyed my small space eclectic holiday décor! I’m now sending you over to Insieme House. 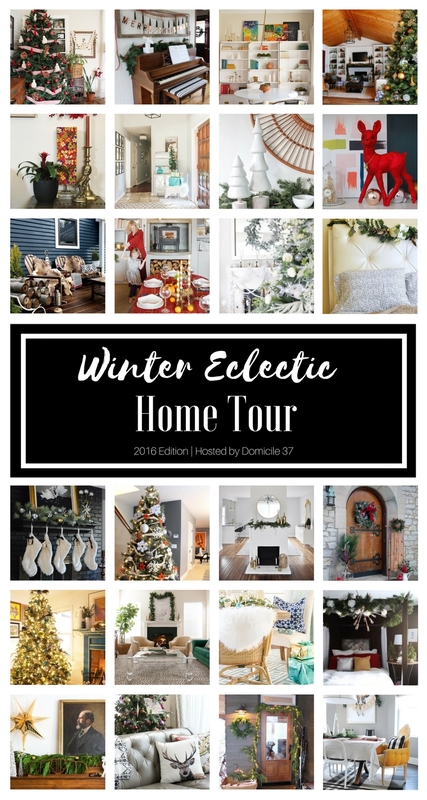 And I highly encourage you to peruse the other homes on the 2016 Winter Eclectic Home Tour By visiting the links below. I’ll be back on Monday with some updates I made to the living room space- yes, again, I changed a few things after I took these photos and I can’t wait to show you all. xo. Monica, looks like you are getting settled, love, love everything from your previous home, but look forward to new and exciting things from you. Could you tell me what is the rug pattern in your living room (the pinkish one).? Happy New Year, and I am so jealous that you live in Corpus Christi ! 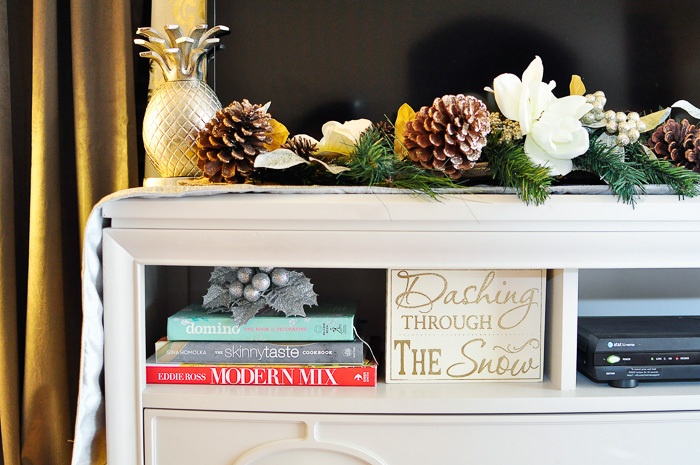 I love what you did with the tv dresser. 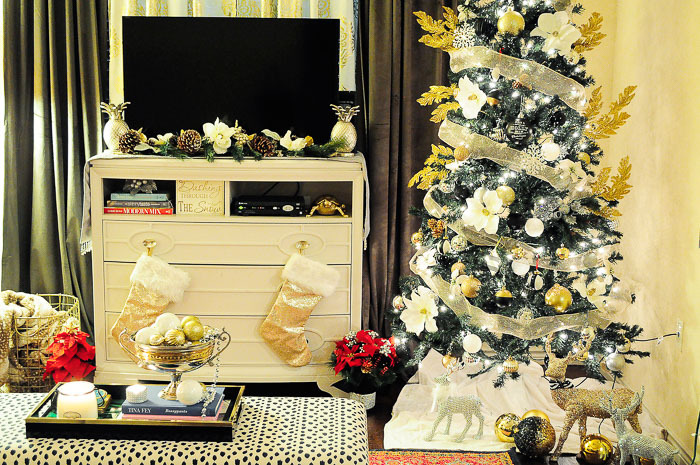 The garland and stockings are so pretty! Gorgeous room (and rug!). 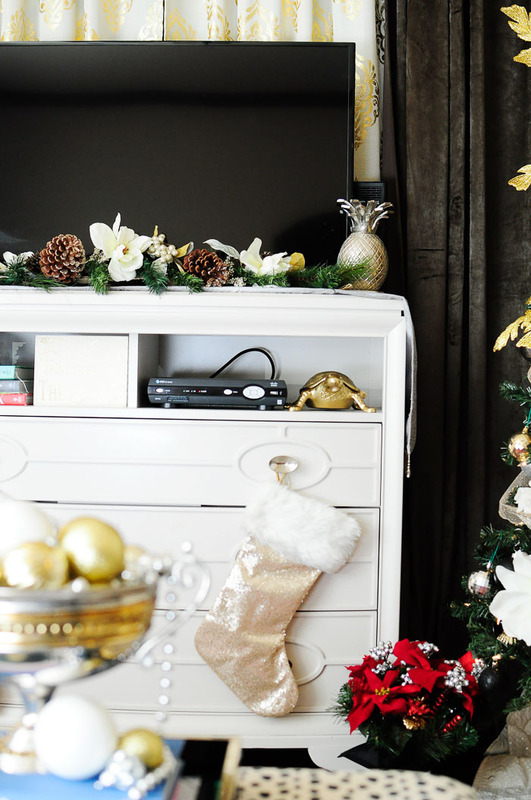 I love all of the metallics, flowers and ornaments! 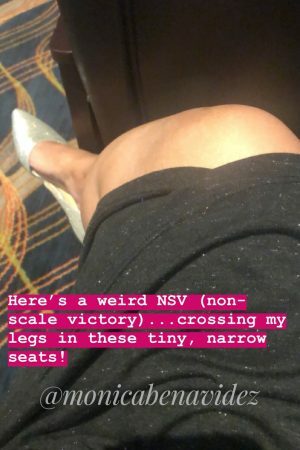 It's such a beautiful space! Happy Holidays friend! Hi Monica–just wanted to tell you that I receive a number of home decor and diy blogs and sometimes I don't have time to read them but I always, ALWAYS read and enjoy yours. Love what you've done with the apartment and hope you and hubby and Pee Wee are soon settled in your new, permanent home. Merry Christmas! 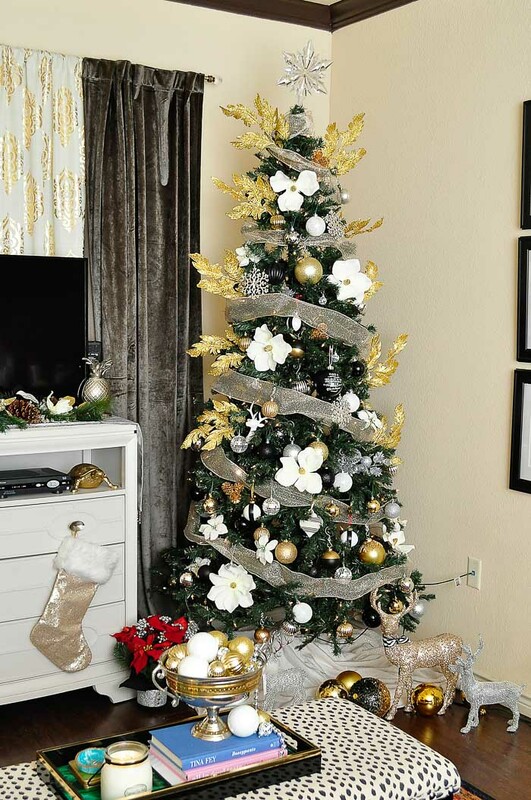 What a great use of space and holiday cheer! 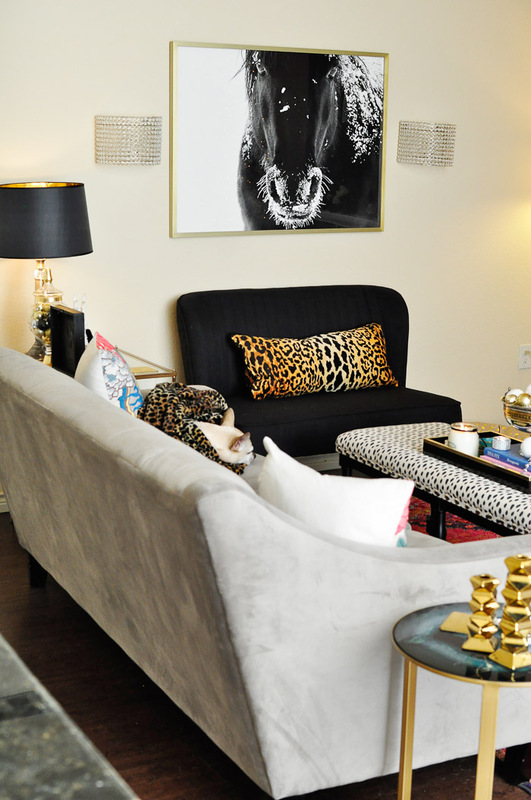 Your apartment is packed with STYLE!! LOVE it! 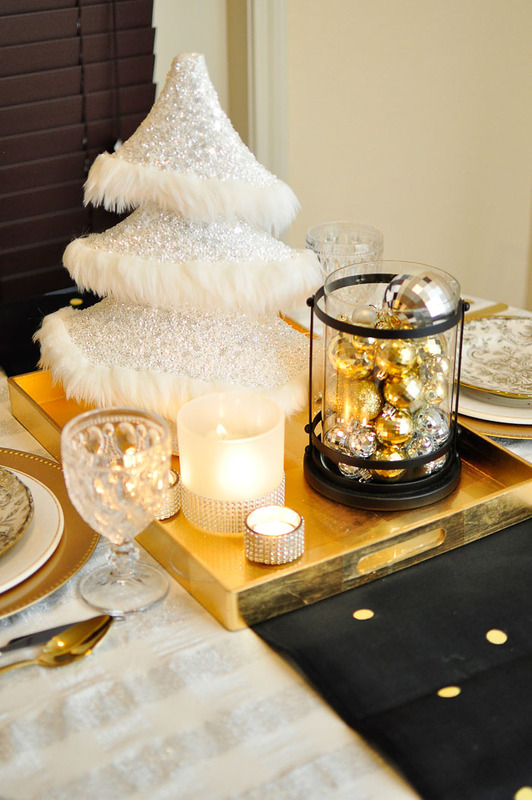 Absolutely beautiful and so incredibly glam…I just love all your high-contrast touches! This is glamour with a capital G! Wonderful. But that little doggy is my favorite part. i just love your bold glam style! 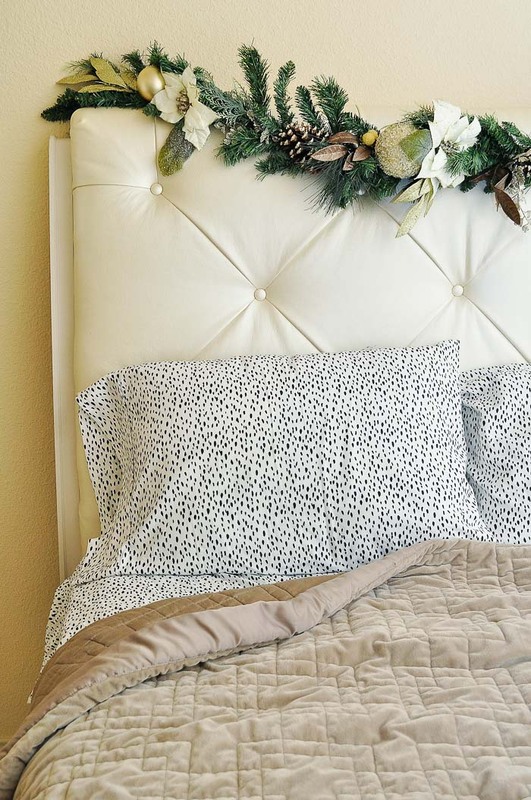 your headboard with the garland is gorgeous! 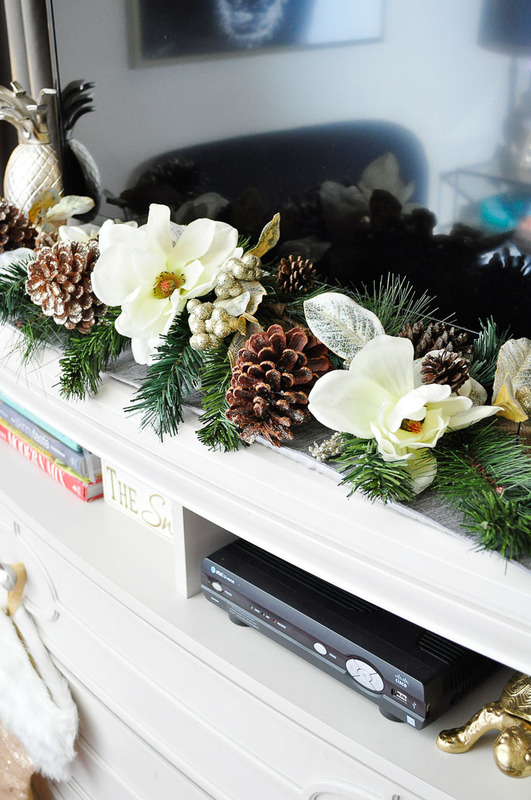 Beautiful holiday touches, Monica! 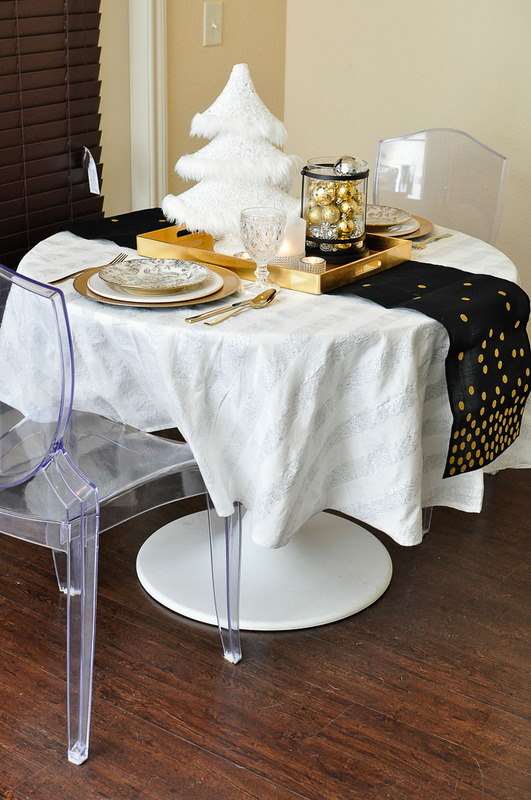 You use your space so well and everything is so wonderfully glam! I love when pets make a peek-a-boo appearance. I definitely pinned a few of these! Good job! I love it Monica. So glam! I like what you have done! It is very glam and so you! I also think the tv looks great against your wall of curtains…and you used a technique that I did in both of my previous rentals- the curtain wall. Love it and the layout.